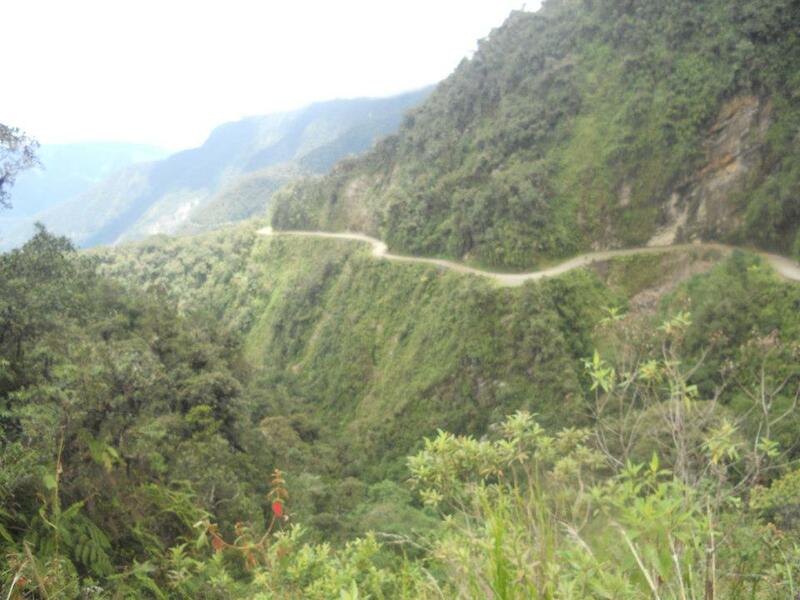 I remember first hearing about Bolivia’s “Death Road” from my former roommate and Serbian brother Nick. He eagerly pulled up a YouTube video showcasing “The World’s Most Dangerous Road.” When it was finished, I looked at him the way I often did when he had a crazy notion in his brain and said, “You want to bike that road? Are you nuts?” So the reader can imagine my surprise when my girlfriend wanted to ride a bike the entire 54 kilometers down the Death Road, and somehow, “Yeah, that sounds like fun,” escaped my lips. 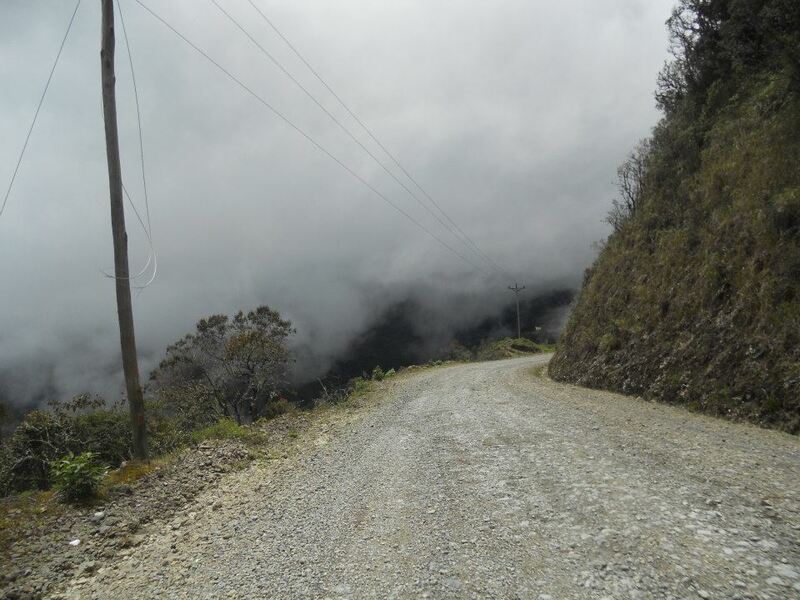 Bolivia’s infamous “Death Road” between La Paz and Coroico is certainly imposing. The thin strip of dirt, often no more than three meters across, winds precariously around mountain cliffs with drop-offs of over 600 meters. The decent from La Paz drops the rider an astounding 3600 meters in altitude, from the snow capped Andes to the rainforest below. The elements can also add unique and unpredictable danger, as thick fog and heavy rains can reduce visibility and traction. Even when the road is dry, numerous waterfalls dot the landscape, and have directly led to the deaths of motorists and bikers. We woke up early to get picked up from our hostel. Christine and I would be joined by Gemma, an energetic Brit from our tour of the salt flat, Bas, a fun-loving Dutchman, a couple of Aussies, and Wendy, a Canadian whose diet consisted of only crackers and peanut butter. 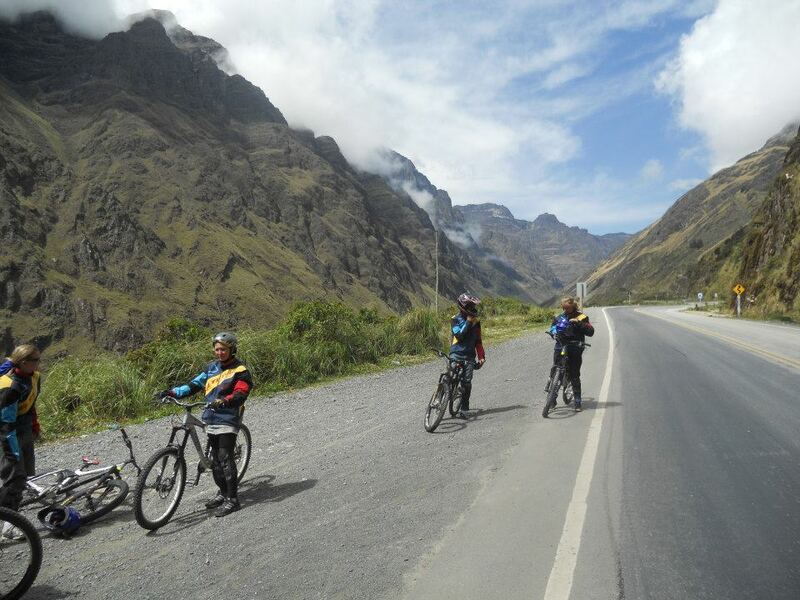 Although La Paz sits at he already towering altitude of 3700 meters, we still had higher to go, the Death Road starts at 4800 meters. Christine and I after a short run on the paved section of the road. The air was predictably hard to breathe, but thankfully we wouldn’t have much peddling to do as the vast majority of our trip would be spent downhill, tightly gripping our brakes, and letting gravity do the majority of the work for us. We were given a short introduction by our guide, and handed matching blue jackets with a broad, yellow, diagonal stripe across the chest and back, and helmets. Our guide made sure to remind the Aussies to ride on the right side of the road, and we were off. The first 24 kilometers were paved, and an absolute thrill to ride. The snow-capped mountains and deep valley provided excellent sights, and at no point did I feel the least bit frightened or out of control. 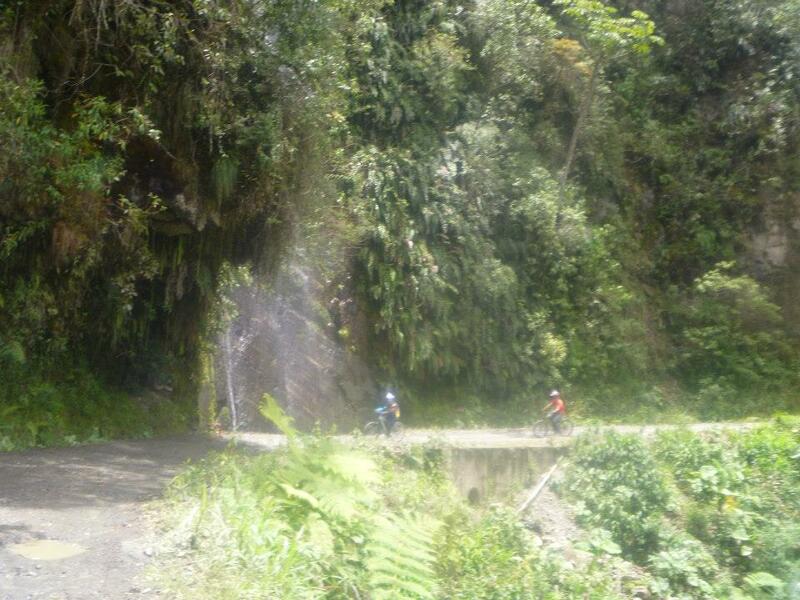 I could have done this all day, but soon we turned off the paved road, and the Death Road would begin in earnest. Christine looked terrified as we began mounting our bikes, so I promised I would be right behind her the entire way. “Promise?” “Promise.” I reminded her that she’s from Denmark, the biking capital of the world (though our Dutch friend did contend with this claim). In turn, she reminded me that there are no mountains in Denmark. At this moment, I paused to appreciate how Christine almost always faced her fears, and it made me smile. Again, we were off, this time over much rougher terrain. 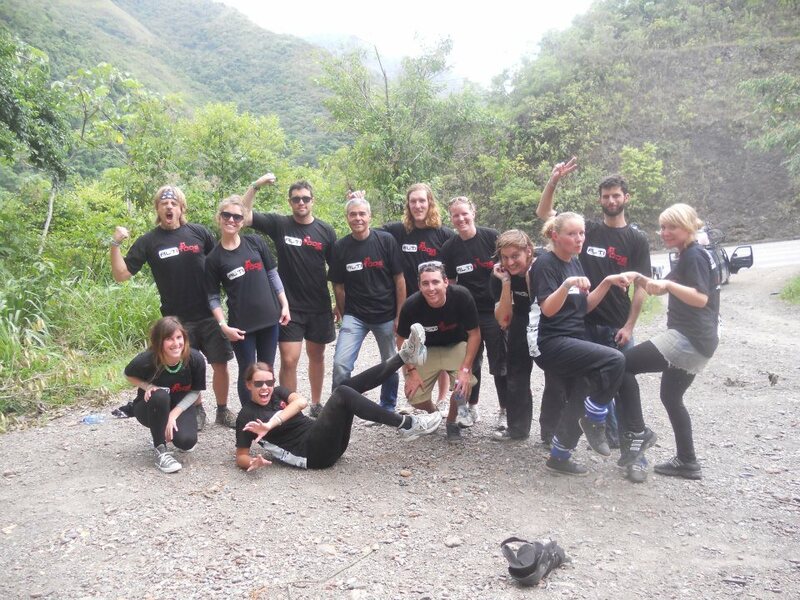 While the first 24 kilometers were accomplished relatively quickly, the next 30 took about three times as long. Soon, the fog cleared and the sights were incredible, if also terrifying. Christine noted how no one had told us about the wonderful views, and this alone was well worth the price of admission. As we dropped in altitude, the temperature steadily rose. Our sweatshirts and matching jackets soon disappeared and the strain from the constant braking and unrelenting bumps began to affect our hands and butts. Here we are again, this time on the much more dangerous dirt section. Between braking, the three or so hours on the road gave me plenty of time to contemplate life’s big questions: What am I doing here? What would it be like to fall off the edge? What did my dad used to say about it not being the fall but the sudden stop that killed? You know, important stuff. By the time we reached a flat section of road, a bit of peddling was welcomed. The relief to our hands would not last long, as the road ended with a treacherous downhill section. Several bikers wound up with more than bruised palms and backsides, including our friend Bas who received a nasty scrape from a fall. The Aussies also seemed more prone to injury than the rest of us. Finally, we reached the end of the road and were handed a black tee shirt that read, “Death Road Survivor.” We then had a celebratory lunch, followed by a quick dip in a pool. All told, we descended 3600 meters in altitude over 54 kilometers. No one went over the edge, and the few bumps and bruises were well worth the fun, excitement, and views. A few days later I had a Facebook message from Nick, “You went on the Death Road without me! ?” Yes Nick, I did. It was excellent, and now I would say that you would be crazy not to go. Note: The photos were taken by a photographer who was employed by the tour company. Due to the obvious safety issues, we were instructed to leave our cameras at home, though I’m sure Christine’s pictures would have been far better. Safe and sound, with new tee shirts to show for it.